We really empathize with where you are right now. You’re about to kick off an incredibly important, and expensive, process at your company by sending out a request for proposal (RFP). You’re sending out an RFP because you need help figuring something out. But, by definition, you aren’t the person to solve it, so how can you write the RFP? Most standard RFPs are crap and you’re here because you don’t want to write the standard RFP. Most standard RFPs are also long, legalistic documents that show how big organizations struggle to hire creative agencies and partners. 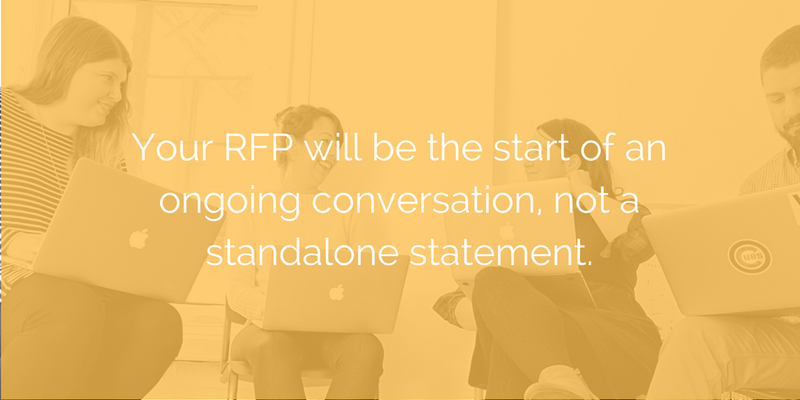 Your RFP will be the start of an ongoing conversation, not a standalone statement. It needs to set the right tone for the kind of conversation you want to have. The RFP process raises a lot of challenges that, no matter how awesome you are, you’re bound to run into. Let’s first identify a few of them, and then we’ll address how to solve them. Most of the RFPs that go out from big companies are extremely impersonal. However, the work is going to to be extremely personal. 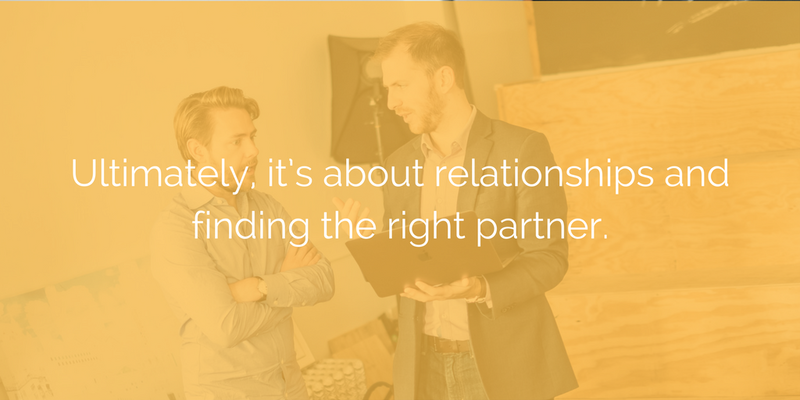 Ultimately, it’s about relationships and finding the right partner. The goal of this guide is to help you engineer the RFP process so that it not only reveals who the best agency is to meet your needs, but also the relationship that’s best for both your company and your vendor’s. In the RFP process, you’re looking for a partner that will guide you in the right direction and tell you what you what to do, leveraging their technical and creative expertise. When your RFP is overly specific with deliverables, it doesn’t tap into any of your potential partner’s expertise and boxes them in with potential solutions. RFPs should be problem driven, not solution driven. For example, in giving our designers feedback, we would give them the problem with the design, not the solution. By asking a question (“What else do you think could be done here?”) and not simply emailing them a stock image for the homepage background, we get creative, non-obvious results. Narrow RFPs lead to both you and your partner doing a box-checking exercise. We want no more than four plugins and the site must load in under 2 seconds. The overall layout should look just like http://cliquestudios.com. Sending out an RFP that is cookie-cutter will get responses from cookie-cutter and box-checker agencies. That’s why you won’t find any completely “fill in the blank” template in this guide. So what then? Are you supposed to leave things incredibly open-ended? Going the opposite direction and making things too vague cause you to fall into one of the biggest pitfalls of the RFP process. Things tend to go haywire when conversations stay high level for too long. High level conversations are great at the outset of the project, but not in the RFP. Simply put, you can’t request specific details that are needed to insure a successful project when you keep things high-level for too long. The way we fix that is by focusing on the timeline and what will happen during the course of the design / development process. High Level: RFP includes information about the entire company, but no bios on who is actually going to work on the project. Improved: RFP includes detailed information about the team that will be working on the project, just like the RFP responses from vendor agencies will. This starts to establish a relationship and improves the responses you receive. High Level: RFP includes a bullet point list of integrations that they’ll need to use. Improved: Not all integrations are equal. One could take ten minutes and another fifty hours. Instead of just a high-level bullet point list, inquire to the potential partners whether or not they’ve done a Salesforce web to API before, how many times they’ve done it, and request links to that work. The more granular, the better. Building on the last example using integrations, mention in the RFP that you’re reviewing skills around integrations and want to look at their team’s skills around them. Let them know that you want the best team and master of every integration isn’t a requirement. You just want to know their experience and comfort. This will help vendors to acknowledge that you’re unique and also gauge whether they’re aspirationally responding (claiming they can do everything or do work they’ve never done), or whether they’re an honest agency worthy of partnering with. If conversations stay high-level, everybody responding can copy and paste a bunch of standard responses – if my RFP asks how long has your company been in business, the cost, your process, etc. everybody who responds is just going to copy and paste, put a number on it, and hope it goes through. Creating an RFP that finds the right partner and right relationship for your company’s project is both art and science. Let’s talk about the science first. Since most of our experience comes from working with RFPs related to web design, development and marketing, that’s what we’ll focus on in terms of examples, but you’ll find these principles still apply to all RFPs. But it’s not just about having these items—it’s what goes into them that matters most. Each section not only allows your potential partners to learn about you, but also affords the opportunity for you to demonstrate that you, too, are aware of them, making you somebody worth partnering with. This section of the RFP is going to give context to everything else you do going forward. It helps project managers (PMs) contextualize every decision made throughout the process, so the better the partner agency understands you and your business, the better the project result. Including items like revenue, clients / customers / users, and all other metrics that would apply to raising capital are applicable here. If your company has multiple products or brands, this is a great place to differentiate what sets them apart from one another in your marketplace and how that will relate to the overall project. Laying out the competitive landscape from the start allows your partner agency to more deeply understand your category and why users are (or are not) choosing you. If you compete in multiple markets, attach a document to your RFP organized by location that list competitors and how you compare. Consider listing other competitors outside of your category, as well. For example: Basecamp’s number one competitor isn’t other project management software, it’s e-mail. Some of the best breakdowns that we’ve seen are demographic data and % of revenue. Additionally, making note of your sales cycle (peak times of the year) as well as items like user churn are incredibly valuable for your partner agency to know. If they respond well (and they will, because you’re putting equal time into your RFP), they’ll address possible solutions for things you may not even be asking for. This information helps them get there. Remember, the more context you can provide up front, the better. This starts with why your customers hire your service, app, or product, and what job it does for them (see more: jobs to be done)..
Also include how often they come back to your business and how they hire you: do they come in through the website, phone, or sales calls? One of the most beneficial customer insights are your customer personas. Elaborating on your top three customer personas will be extremely valuable for your potential partner. If the goal of your project is to attract new customer personas or appeal to a new audience, include that here as well. Any way that the partner agency can get a better feel for your customers is important. This could be links to your Yelp (or other aggregator) profiles, searching your social media accounts, or even branded hashtags that your customers use. For whatever problem your project is looking to solve, how do you solve that problem now? What were the goals when that project or process was initiated? The more your can share with your potential partner, the better (you’ll hear us say that a lot), so include various platforms or engines that power your business (payments, tickets, support, etc.) as well. Without being prescriptive, paint a picture of what you’d like the end result to be as defined by the problem that it will solve for you. Don’t only say: We want a website that looks like A and does B in these specific ways. A better starting point for your future state might be: We want X outcomes and we think that a website that looks like A and does B might be a good start, but we’re looking for you to give us your take on that. This is one of the few times that it’s okay to keep things high level. Often, there will be specific brand guidelines, such as brand colors and fonts. These are very helpful to include in an RFP. The key to this section is to not elaborate further. Anything beyond that becomes prescriptive and really limits your potential partners and what they might come up with. The best RFPs we’ve seen have varied goals that are outlined clearly, whether it’s marketing, hiring, acquiring users, user interface, sales, scalability, raising another round of funding, acquisition, etc. The goal with goals (…ha) is to speak with clarity. It’s a challenge to your prospective partner to answer these questions thoughtfully and exhaustively. Better: Double our team size. Best: Double the size of our firm, adding seven new veteran attorneys by the end of the year. Clearly defined goals also tell your potential partner that you know what you’re doing. 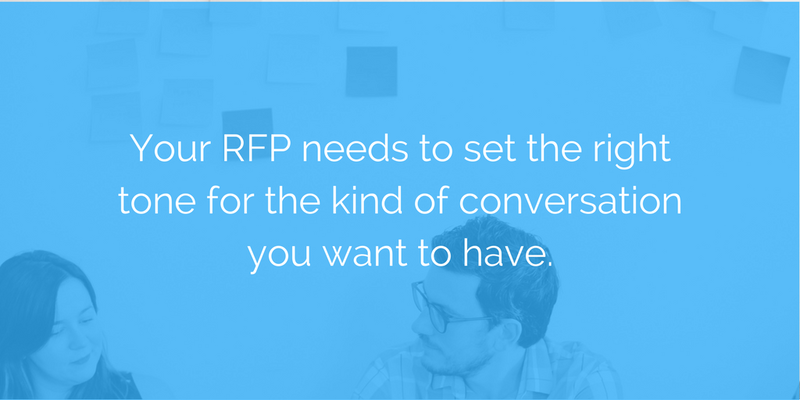 An RFP is an interview that works both ways and both sides want to work with a professional. A good agency is going to be grading you, as well. Another item that can be included under goals is how the project will influence other parts of your business, such as paid acquisition, SEO, app usage,etc. The best RFP “Goals” sections explain that your company has a problem, and a new platform that needs to be built. We want the platform to solve these ten things and we want an active engaged partner to guide us through that process. Laying out early on who the decision-makers are in this process is helpful for a potential partner. Transparency builds trust and trust builds relationships. By arming them with with a level of honesty regarding the fact that this is a partnership, not a dictatorship. Both sides will have teams and timelines to manage so the sooner we can show respect for our potential partner’s time, the better our project result. Without being overly prescriptive, you need to lay out what our new project will be able to do and how it will work within your existing system. Use these points to ask questions of your potential partner and open a conversation around them, versus telling your future partner what widget to put where. List the products and services you offer, and to whom. This is a section that often trips up companies like yours because it becomes overly prescriptive with specific requirements for header navigation, footer requirements, and calls to action. 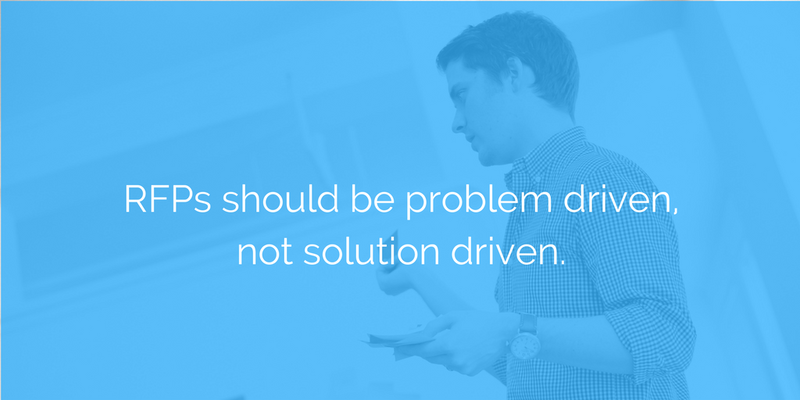 This is the work that you’re hiring a partner to solve for you, so let them solve it. Provide as much context as possible for the question you’re about to ask: What CMS should we use? 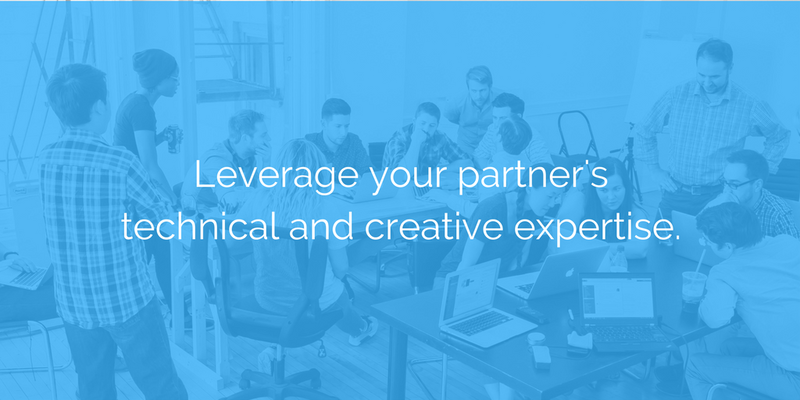 Give your potential partner agency the current CMS that you’re using, as well as the limitations and benefits you find with it. Too vague: The CMS should be intuitive and user friendly. Too specific: The CMS should have the ability to add custom-designed social share buttons. Perfect: We need to be able to add images and include alt text. Will you be migrating content from a past website or creating it fresh? Is that content going to be created by you prior to launch or post-launch? Or do you need someone to help create it? Outside the world of web design and development, are you migrating existing databases of information or previous versions of your product? Do considerations need to be made for how that will look in the next CMS? Don’t be afraid to ask for something challenging in your project We receive RFPs all the time that ask for a super-fast website, with tons of movement, video, and a slew of other things that conflict with one another. Remember, the more intentional your RFP is, the better partner you’ll attract to your project. Another great section to ask questions is in the SEO section (for a web design RFP). Let the potential partner know that, given what you’ve already proposed, you’re looking for their expertise in this area. Accessibility is often something that’s often inserted as a matter of law, versus a matter of priority. In 2017, Kmart, McDonald’s and others settled lawsuits over website and app accessibility. If it isn’t a priority, the law quickly reminds us to make it one: in the first eight months of 2017, 432 lawsuits were filed over website accessibility. Instead of requiring the website meet “ADA standards” or some other vague guideline, consider asking your potential partner how they’d include those standards in their work. Accessibility depends on what you’re making and who you’re making it for. For example, if you’re creating a medical database, there are legal requirements you need to meet. If you’re an education startup working with public school to adopt what you’re creating, there are strict legal requirements you have to follow to attain federal funding. Are you going to require that your partner meets certain accessibility guidelines? In general, if you aren’t a company with an obvious legal requirement just to sell the product, give you potential partner agency the guidelines you’d like them to follow. Most firms don’t guarantee legal compliance, and while that doesn’t make them bad people, you need to vet whether or not they know anything about accessibility or if they’re giving you the “we can do it all” response. Do you have particular accessibility legal requirements? List them. Particular sets of guidelines (such as the WCAG)? Include them. Have a specific accessibility conformance level? Say that. Depending on the level of accessibility you require (such as Single A versus Triple A), the workload can change drastically. It matters a lot for your potential partner. Instead of waiting to answer questions about it later, use the RFP to let your future partner know why you have requirements for accessibility. Note: This should be done through consultation with your own legal advisor or advisor through your partner agency, not us. We are not lawyers. But, we do take accessibility serious on our website designs. If you require a database to be created or configured, what will you need it to do? What will it be used for under optimum conditions? What flexibility may be needed in the future? What third-party integrations are you currently using in your system? Are there any that you would like to see utilized in the new project? Use this section to ask questions about a vendor’s comfort level and experience, noting that expertise in all integrations is not a requirement. If it sounds like it is, vendors will claim they’re experts at everything. They never are. What functionality will your project absolutely have? For example, if you’re a theater, visitors must be able to purchase tickets and select their seats. If your project is an application that allows visitors to reserve parking spaces in cities, they must be able to view available spaces in real-time on a map, select the location, reserve it and pay for it within the app. Additionally, are you open to re-thinking how these things work together? If you are, note that in your RFP that you’d like to leverage your partner’s expertise and see their recommendations on how things could be done better. Many agencies, like ours, have in-house marketing and UI/UX teams that come together on web design and development projects for projects that require them. If you’re like us, there’s a good chance you’ve done your homework and have a million things you’d love to have included on your new project. This is where you can let your hopes and dreams for the project shine, or at least get them out in the open for your partner to think about. The more honest you are here, the better proposals you’ll receive. List out what security functionalities you currently have in place and what you would like to implement in the future state of the project. For example: will the site require an SSL certificate, how often will the site need to be updated for plugins, and how often do backups need to be run? List who you currently use for hosting and inquire about how to improve your contract with your current host (if you have one). What requirements do you have for uptime and page load time? Are you open to changing your hosting service based on your partner’s recommendation? Your “Timing” section of the RFP will include everything a potential partner needs to know about what to send to you and when to send it. When is the closing date for receipt of all tenders? When will the partner agency be chosen and when would you like the project to be completed by? Some of the best RFPs ask for details around the specific phases, milestones, deliverables, and outcomes at each milestone. Additionally, the partner agency would supply the time and cost of each. Let your potential partner know that you prefer more detail in the response and those will be looked at favorably versus a high-level overview. Let your potential partner know that you’re open to questions and to submit what they’ll need to know before moving forward. We can’t understate how important it is to ask participants to provide details for the queries you’ve mentioned in your RFP. It shows their willingness to read an RFP that you’ve crafted and shows they aren’t “box-checkers” or “copy/paste” agencies that send out replies to RFPs en masse. Where possible, assess vendors’ capabilities on specific tasks for your project. What we want most as a deliverable here is their recommendations. Sometimes, things have to be done a certain way (your whole company is using Salesforce, with a 200+ person team, and you have to use Salesforce), but otherwise it should be very open-ended. What experience do you have related to our project? Do you have a case study we can see? Who will work on this project? These are generic, but important, questions so please ask them, but also consider asking more so that the agency can’t copy and paste what they’ve supplied to every other RFP in the past. What’s something you believe that some of your contemporaries might disagree with? What experience do you have that is most representative of what you’ll do here? What risks do you feel are present that we haven’t addressed as part of this RFP? What we need to discover here is why they care about this opportunity in particular—is this just another proposal as a part of an automated process or do they actually want this project and care about your collective success? How will the potential partners submit their responses? The best way we’ve seen this done is providing the email address to send their responses to and what to put in the subject line (again: can they follow directions or are they copy/pasters?). How long after the deadline will you move forward with in-person presentations? Again, you’re listing out your team that will be working on the project along with their associated roles. How Do I Know Who To Send My RFP To? Now that you’ve completed your RFP, how do you know who to send it to? I’ll give you a hint: it’s not Googling. In fact, that’s the biggest mistake that companies make when putting together their RFP. Unless you’re hiring an SEO company where their Google rank might be correlated with the ability to get you results, Google’s algorithm has nothing to do with how successful they’ll be on your project. Too many big companies think that because they’re big, they need to go with the same team that other big companies use. In the same vein, many startups fall into the trap of raising a significant round of money, feeling on top of the world, and going with “the biggest and the best” in every area they can, flying through their newly-funded capital with reduced discernment. Setting yourself up for success on your project has infinitely more to do with how you qualify who you send your RFP to than it does with how big a potential partner’s name is. The thinking that “more is better” makes sense at first glance. Why send your RFP to four suppliers when you could send it to forty? With forty, you get a much better standpoint on the baseline cost and capabilities, right? Yes, but you’ve forgotten to consider the opportunity cost and informational overwhelm of having to effectively evaluate forty proposals. If you estimate that roughly 90 minutes should be spent evaluating each proposal, the time and effort adds up quickly. The result is that none of the proposals get reviewed properly, often getting skimmed or evaluated based on the estimate pricing at the end of the proposal. This hurts both your relationship with the suppliers and your reputation in your industry. If you evaluate them correctly, you won’t need to send your RFP out to more than five or six suppliers. As the project becomes less complex and/or less expensive, that number goes down to two or three potential partners (the fewest we’d recommend). It’s with all three of these mistakes in mind that we recommend doing research ahead of time and targeting your RFP to digital partners that are likely to return the best responses. By properly vetting your candidates ahead of time using the criteria below, you’ll save your company 50%-75% of the hours you would have wasted on evaluation later on. Who does your board and/or mentors recommend? Can they refer you to another company that they’ve worked with that might be able to make recommendations? Social Proof – This includes awards, case studies they’ve produced, current portfolio, client testimonials and past clients. 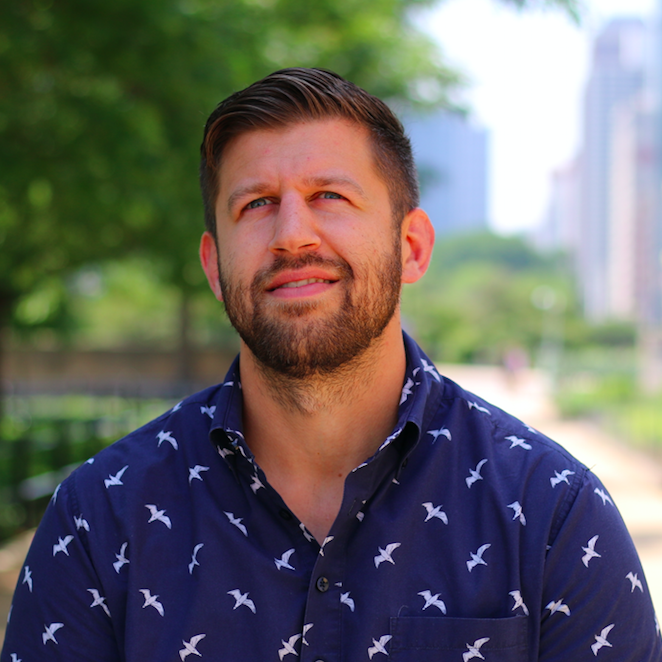 Thought Leaders – Is the agency a leader in their space? Do they have prolific team members that are also influencers in their respective fields (here’s one of ours)? Often, this is a great indicator of how supportive the agency is of pushing boundaries and remaining on the cutting edge. Values – Does the agency have a published list of their values (we do)? Do they appear to adhere to those values as you’ve seen them lived out in their work? Relationships – How much are they into putting in the work? Do their past clients still recommend them after the project has finished? Have they continued to work with the same clients over and over throughout the years? Process – You’ll be speaking with your partner every day for the next 6+ months across phone, text, email, conference calls, etc. Are they good communicators? Are they good writers and do they value teaching others? Are you going to enjoy communicating with them, and learning from them during the process? Skill – At the end of the day, we’re all making similar things, whether it be apps or websites. It takes a high-level of skill to execute on your upcoming project so, while this may seem like the most important factor going into an RFP submission process, working with a mad genius with high technical skills often just results in madness. If you ask every person on your team, given the current information they have, whether or not each agency would be acceptable should they win the RFP, does any single person answer negatively or seem unsure? If so, recognize this as a big red flag. From the outset, every single agency receiving the RFP should be acceptable should they submit a winning proposal. Tip: One of the best ways to pre-qualify potential partners is to send out a quick email to their teams, letting them know you’re putting together an RFP with a brief project overview and asking them if they’re interested in receiving it. If they don’t reply, you know they aren’t a fit for you. You’ve dedicated the time to creating an incredible RFP, procured a team dedicated to vetting the proposals, and researched your potential partners. Next, make sure you have a rubric of your values and goals for this project to help make decisions based on the team’s vision rather than personal preferences. Remember, a good digital partner is going to put a lot of work into their response, so they may choose not to respond at all if they feel the request isn’t genuine. You’re choosing a partner you’ll talk to most days for the next six months. Know what they stand for and believe in, how they work, and why they’re the best, in addition to references and making sure they’re trustworthy. At Clique, growth has come from being open and honest about when a project is not a good fit for us because there’s a lot of great companies that do what we do, but when it’s a fit, we make sure the company knows why. Send emails to 7 vendors via a shortlist asking if they’d be interested in receiving the RFP. Let them know when the RFP will go out and when you need to know their “intent to respond” by. Send out the RFP to those who reply by the date provided. Answer all questions in a document sent to all possible partners. Narrow down to 3 vendors. Conduct phone calls with vendors. Narrow down to 2 for in-person presentations. With few exceptions, how the proposal process goes will be how the project goes. How the company operates during the proposal will be indicative of how they operate during the project (on both sides). If your team members seem disinterested and aloof during the pre-RFP process, they probably shouldn’t be a part of the RFP. Likewise, this is true for potential partners as well. 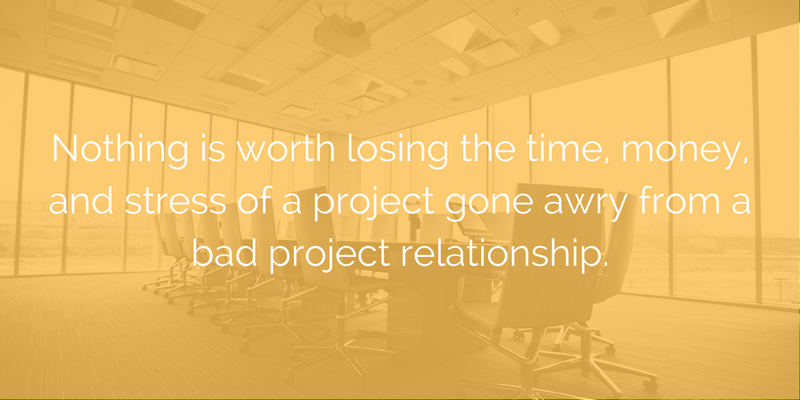 No matter how great a company’s work is, nothing is worth losing the time, money, and stress of a project gone awry from a bad project relationship. The ultimate leverage is not being desperate. If you have any other questions about your RFP, get in touch. We’d love to help. Here’s a few more bonuses to get you going. Consider it access to our personal swipe file. You have been invited to participate in the RFP for PROJECT. The letter of intent must be received by TIME on DATE. Submit via email to ADDRESS and place “SUBJECT” in the subject line. Email attachment must be PDF file. Please also attach the cover letter. A confirmation email will be sent to your designated contact upon receipt of your Letter of Intent. Please contact STAFF at PHONE NUMBER if you have submitted a Letter of Intent and do not receive confirmation by DATE. Our committee will review the letters of intent. Applicants selected to submit a full proposal will be notified by DATE. All applicants invited to submit a full proposal by DATE. Full proposals will be due to US by DATE at TIME. Please be advised that both Letters of Intent and proposals are non-binding. Your request for proposal (RFP) cover letter should accompany your official RFP document. Why do we need a cover letter to say the same thing our RFP says? You’ve already received an “intent to respond” from your potential partners and your cover letter gives you a chance to, once again, reiterate the importance and overview of your RFP process timeline. Describe your current state (the problem you are looking to solve), your project and how you see the project as meeting your business objectives listed above. Present the overall RFP and project timeline. Staying really granular on timelines and deliverables is going to make or break the success of your project. Highlight the major events and due dates so there are no unforeseen delays. When and how to submit pre-proposal questions and how the answers will be delivered. Specify the requirements for the proposal (structure, format, electronic versions, number of copies) as well as where they are to be delivered and by when. Time is money and the more time that you can save in this process, the better. Avoiding undue delays by clearly and effectively communicating your timeline helps to guarantee that your selection process timeframe and budget remains accurate. One of the biggest mistakes we’ve seen is companies expecting to receive items on the days they ask them to be submitted, even if they are submitted digitally. Always allow for a reasonable amount of time between submission and receipt deadlines. Have your entire team read and re-read the cover letter to ensure that a prospective partner understands where and how to submit items based on your clear instructions. Also, be very clear within your team who will be receiving what items and when. Finally thank the person for their interest in your project. They’re going to put in a lot of work and make a financial commitment to their proposal, and so are you. Beyond receiving their letter of intent, the cover letter kicks that relationship off on the right foot. Obviously, consult your legal team for further information on areas that can best leverage their expertise. We’re a bright, talented, and extremely hard working web design agency, not a legal firm. You have been invited to submit a proposal for PROJECT in accordance with the attached request for proposal (RFP). NAME will be the single point of contact for all inquiries and correspondences. Please contact him/her at EMAIL and PHONE. Thank you for your time, effort, and interest in working with COMPANY on PROJECT.